This post is way overdue because of some nasty WordPress hackers. During the last couple of weeks my husband I have finally gotten back into renovating mode. He has been working on getting us together a bathroom in the new house and I have been gutting the old kitchen to make ready for new drywall and a new ceiling. My husband was not sure at first that tearing down the ceiling was necessary, but, boy oh boy, I am so glad I did. Resting in their final repose above our heads was a mummified squirrel, some mummified mice, a mummified snake (I think? ), and a not so mummified deceased bird. Can you say nasty yucky gross? I took the weekend and did some things I consider fun. Planting flowers, herbs, and seeds on Saturday. Cleaning out the garage on Sunday. Wait! Cleaning the garage is fun? Well, in this case it is. The garage cleaning is at the Victorian house. The house used to be owned by a preschool teacher (and serious packrat) and I made the mistake of purchasing the contents. Most of the stuff is just plain junk, but occasionally there is a surprise. 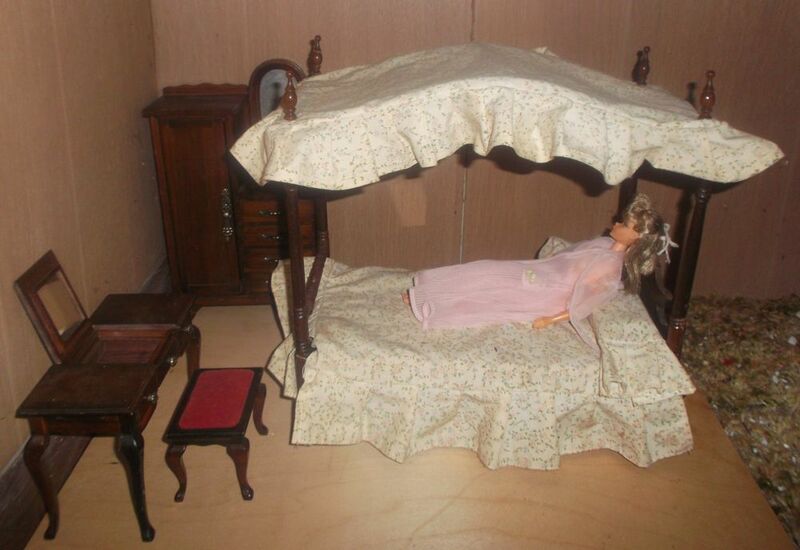 I’ve uncovered an old record player cabinet, some vintage Barbies, a Brownie (as in Girl Scouts) doll, Lincoln logs, an old chair with potential, and a child size chifferobe. The chifferobe and a lot of the preschool furnishings went to a neighbor who loves to repurpose old furniture. In the course of packing, I rediscovered some old Concord furniture I had tucked away. Back in the nineties, I think it was, Concord came out with a line of furniture that was 1/6 scale/Playscale. I snapped up some for my daughter to counteract all that Barbie pink. Unfortunately, at the time funds were tight (still are!) and I could only get some of the pieces available. You can see a real Ethan Allen Colonial influence here. Not sure if I want to keep it or sell it. 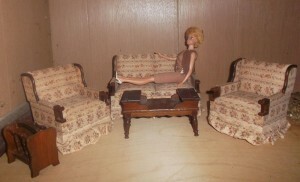 When it comes to Barbie, I prefer 1960s vintage. A quick Menu Plan Monday! Yes, I know it is Wednesday and I actually cooked Tuesday this week, but what the hey. I don’t know why, but I have never made chickpeas from dried before. I did this week and it will be my new thing to do. Super easy (as in soak and boil) and cheaper than canned. P.S. Still have snow when it should be Spring? Check out all the Spring Flowers Clipart over at Bry-Back Manor! This entry was posted on Wednesday, April 24th, 2013 at 2:52 pm and is filed under Menu Plan Monday, More. You can follow any responses to this entry through the RSS 2.0 feed. Both comments and pings are currently closed.